The Gardeners’ Guild ESOP (Employee Stock Option Plan) Communications Team wanted to help the Contra Costa and Solano Food Bank in their efforts to provide food during the Christmas holiday. 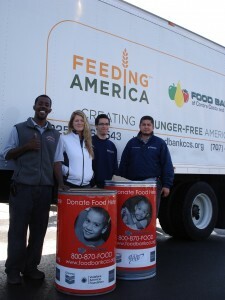 The organization brought over their bins and starting Monday, December 27th, we began filling them up! $50.00 food contribution from our 2011 Super bowl fundraiser! The Food Bank is a centralized warehouse that stores and distributes donated and purchased perishable and nonperishable food items. They distribute directly to low-income people and make food available for other nonprofit organizations serving the ill, needy and infants. The people they serve include children, seniors and the working poor. 50.5 % of all client households had monthly incomes less than $1,000.